Formulated with a high concentration of natural ingredients including Rosehip oil, Macadamia Nut oil and a blend of herbal extracts to soothe, moisturise and protect; leaving hands soft, supple and nails strengthened. An uplifting blend of pure Rose Otto and Coriander essential oils helps to balance the skin and leave it lightly fragranced. The luxurious and non-greasy formula is rich in anti-oxidants, vitamins and essential fatty acids to repair and condition the skin. 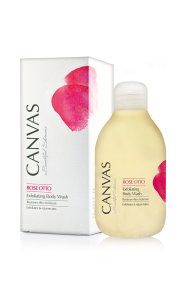 Rose Otto replenishes moisture, protects from moisture loss and restores smoothness. Macadamia Seed Oil and Rose Hip Oil deeply nourish skin, reduce wrinkles and strengthen nails. Coriander is effective against harmful bacteria and oxidant, used in treatment of skin inflammation. Massage into hands until fully absorbed. Re-apply as required throughout the day. 2017 CANVAS BEAUTY PTY LTD. All Rights Reserved.